Who's#92 on the Cardinals? Is that the USF kid? LOL. Seriously tho, he's has a great story. Did you guys know he was undrafted? I couldn't believe it either the first thousand times I heard it. Also, the collective Augie/NSIC/D2 thirst to make Zylstra their own is pathetic. The dude caught 1 ball for Augie, he's a Cobber. Apparently, Thielen only got a $500 scholarship. Incredible! What are the chances not only he plays on Sunday but he gets drafted by a team?! 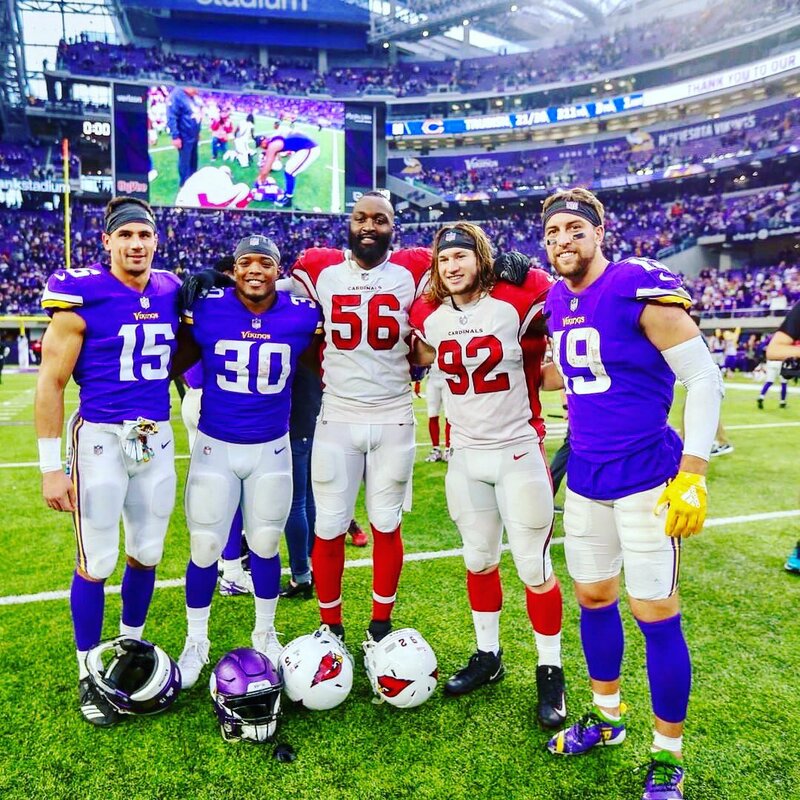 Thielen is a great person, and it's great to see him having success at the professional level. Haven't met the other four gentlemen, but I'm sure they are also fine individuals. Scouts have already looked at him. The problem is, NFL teams are afraid of hearing boos on draft day. Especially now when they have made it a complete clown show. Now Treadwell had a good game on Sunday, but overall he has sucked. Why does he keep getting chances? Because he was a high draft pick that cost big money and the bosses are afraid that if they cut him and he becomes All-Pro somewhere else that they will hear about it. In baseball, David Ortiz would be an example. Plus they think that they can hire a free agent for cheap rather than using the draft choice. It is a numbers game. Good point. I suppose the purpose of a late round is to draft you think you don’t have as much of a chance in free agency.. If that's true, and whatever the reasoning is, it kind of dampens the story that the MN sports writers like to flash every waking second. Certainly doesn't take away from his abilities as an athlete though, I don't mean it in that context. I think that is correct. And of course, the legend grows each week. I saw today on TV that some guy has (or is writing) a book on Thielen. For me, you could probably write about my athletic career in a paragraph. In the grand scheme of athletic careers, he is still unproven. Seems a bit early for that. I would agree. And he is my favorite Viking. Back in 1967, about a month after the Six Day War, I saw a book for sale about it. I didn't bother to buy it- not just because I still hadn't entered 8th grade- but because I knew it wouldn't have much new information in it. LOL it's the national writers doing most of the talking about that fact. I'll give you that. I follow some on social media, and it can be insufferable. But the local sports writers up in the good 'ole Twin Cities toss out their fair share of insufferability. I thought it was odd last year how a few of them magically seemed to care about the Mavericks in the playoffs... yet probably couldn't name the starting quarterback.